When one is summoned to serve jury duty with the Los Angeles County Superior Court, Criminal Division, you are told to park in the garage at the Walt Disney Concert Hall (pretty much an empty parking garage during daytime hours). I have parked there several times, thanks to jury duty. Also, one of my favorite places in LA to go is to the REDCAT, which stands for “Roy and Edna Disney Cal Arts Theater”, which is in the basement of the Walt Disney Concert Hall. It is an alternative arts space, featuring amazing art exhibitions, experimental films, and various avant garde theatrical or musical presentations. I have loved everything I have ever seen at the REDCAT, and even think it is a great place to go just for a drink or a cappuccino in their lounge. Also, the other people one meets down there are quite unusual characters and well-worth getting to know, such as those of indeterminant gender I have seen at various of the “way way way out there” presentations I have gone to. This really is a place to go for one to broaden their horizons in a way that those horizons need broadening. But for all that parking in their garage, I had never actually gone to a concert at the Walt Disney Concert Hall, itself, so this time after I finished my jury duty, I got smart and bought a ticket to something at the box office that happened to be open as I was heading toward the entrance door. I took a glance at their schedule to see what was coming up soon and saw to my great delight Herbie Hancock, who has long been one my favorite musical artists. I hadn’t realized that they had jazz concerts, too, at the Disney, but Herbie Hancock is a serious musician to the match of any symphonic composer, so he definitely belongs there, in my opinion. The friendly person in the box office told me that his concert was completely sold out, but she would check to see if anyone had turned in their ticket, which is, apparently, a privilege for subscribers. If for some reason they see they are unable to attend a concert for which they had requested a ticket, they can turn them in for a refund (or maybe exchange) and therefore their seat would be available for a “Johnny Come Lately” like me. There WAS a ticket available, right in the center of a section that happened to be the second row from the very top of the concert hall. This was fine by me, as I quite often buy the absolute cheapest ticket I can find that is, at least, near the horizontal center. This certainly saves me hundreds of dollars a year, and rarely has harmed my enjoyment of anything I have seen. The Pantages in Hollywood is a theater where one can sit with their head practically touching the elegantly-worked ceiling without the slightest handicap to their enjoyment—I had a thrilled enjoyment of “Riverdance” and “White Christmas” that way, for example. The only show I had seen at the Pantages where my distant seat was a disadvantage was for “The Lion King,” where it was hard to enjoy the animal mask and puppetry costuming, which was one of the main features of the show. Obviously, that was a rare exception. So, I very excitedly bought my Herbie Hancock ticket for a seat way up near the top and very much looked forward to the concert. A couple of weeks later, I received an advertising e-mail listing various upcoming concerts in Los Angeles. Now, after the death of Michael Jackson, I had been kicking myself for never happening to go see him in concert. You know how that is…you take something (or someone) for granted and then when they suddenly are gone, you realize all the opportunities you let slip by. Well, there was now no chance to ever see him in concert, but this LA concert listing showed that JANET Jackson was going to be performing in her “Number 1’s, Up Close and Personal” concert at the Gibson Amphitheater at Universal City Walk. Well, I have long loved Janet Jackson, so, it seemed like a perfect time to get a ticket to THAT concert, as well. However, price very much was an object, plus it looked like tickets were selling pretty quickly for this concert, so, unless I wanted to spend way more than I wanted to spend, I had to be satisfied with a ticket that was not only pretty high up in the amphitheater, but way, way, way (ALL the way) over to the left side of the semi-circle. Looking back at it, I’m not quite sure why I was willing to buy such a badly-located seat; it could be that the next best location was (to me) shockingly expensive, or maybe I felt that it just wouldn’t matter, seeing her sideways instead of straight on would still be seeing her and, of course, I definitely should be able to HEAR her. As I have written here, “cheap” seats had rarely been a problem. Anyway, I bought a ticket for that seat (costing a little under $60; how many CDs, DVDs, or downloads could I have gotten for that amount of money, instead--two, three, maybe even four, is my guess). 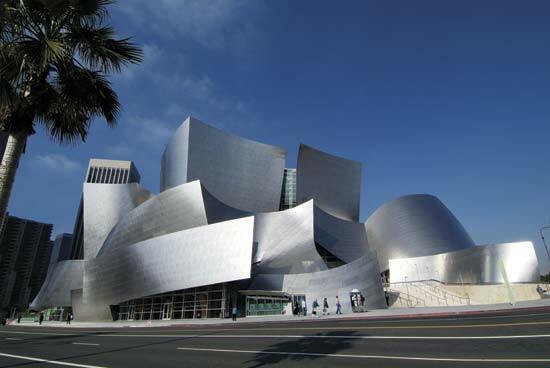 It was exciting to be parking at the Walt Disney Concert Hall and to be actually going to a concert there. I had arrived early, so wanted to go get a drink at their “hidden garden” that I had read about. Alas, the usher I asked for directions to the garden was surprised that I thought there was a bar there (well, SHOULDN’T they put a bar there?). Also, the garden not only isn’t hidden, its entrance is a stairway right from the street, so, day and night, anybody could go up there if they wanted, they didn’t have to be a patron of the concert hall. Surprisingly, there was only ONE couple up there, sitting at a table having a picnic dinner that they had brought (and seemed none too happy that another person was up there, now). I didn’t understand why there weren’t more people up there enjoying the atmosphere. Maybe few actually do know about its existence. So I looked around, and then made my way down the various layers of patios and gardens until I got back down to the street level. Around the block was the front of the concert hall again, but up on another elevated patio was on display a new Acura SUV and a man and woman eager to demonstrate this vehicle (this is LA, so you will often find a car on display at an entertainment event or in a shopping mall, usually associated with a drawing to win one, but I never fill out those cards because all they get you is constant sales communications). So I went up there to praise the car and promised them I would tell my sister about it, who is a devoted Acura fan. I then saw that people were being let up the escalator beyond the lobby into the concert hall antechambers, so I went on up to the highest layer of the building, the last entrance on which was the doorway to the section where I had my seat. However, they weren’t ready to let anyone inside, yet, so I found a relaxing French-curvy couch near the stairway and read my program, instead. Every once in a while, a couple or two, newbies like me, would come up, but they were just exploring the interior of the building, which was a complicated maze of levels, stairways, waiting rooms, bars, and architectural features. I loved it, considered it to be fascinating. Then a young man and an older man came up, I figured they were father and son, although the relationship could have been something else, and sat down near at the other end of the curvy couch. The young man, probably high school age, I guess, was amazingly beautiful in an unusual way, that is to say, he had his own unique style. His best feature was his VERY long dark hair (nearly down to his waist) that he had in a pony tail (but it flowed widely below the constricting band). Up until that moment, I had hated the look of guys in a pony tail, all of whom I had seen (but not lately….I think that fashion fell out favor) had been fading middle-aged men attempting to grab onto a sort of artsy-intellectual, South American tango-dancer sort of cache; in other words, just too self-consciously affected to be able to stand or to treat seriously. But somehow on a young high school boy, this was very appealing and sensual. I studied him discreetly to determine whether I thought he was popular in school (as I felt he should have been), or a bullied pariah. He certainly seemed confident and independent, to look the way he did, so I figured he probably was one who drove everyone in his class into an emotional turmoil--attracted, yet at the same time feeling inferior. Beyond his thrilling hair, he wore a black suit and a white shirt and a classic narrow black woven tie—he was so retro/cutting edge fashionable that I wonder if he understood this or was it a fortunate accident? The only discordance to his look was his white gym socks and some kind of Rebok or Nike shoes, which was, in its own way, charming, and to be expected for one so young (those could actually be the only shoes he owns). As for the Dad, HIS appearance was more typical, unremarkable older man (but certainly SOME parental unit in that family was either engendering of, or accepting of, their son's apparently never-cut hair), but he had brought his son to a Herbie Hancock concert, which I think was a demonstration of quite good parenting on his part. I really would like to see way more dads doing things like this with their sons. I, myself, was pretty well-dressed up, part of the fun of going out to something like that. I enjoyed seeing the other well-dressed men and women who filled up the seats around me; this demonstrated to me that they considered this a special event. All of whom had, like me, purchased inexpensive seats, but all were impressed at how well we would be able to see even from up there. I noticed complicated baffles up on the ceiling and realized that an acoustical genius had been involved in the architecture of this building, so I expected the best regarding the sound (and, oh boy, did I ever get it!). Also, I loved it that the people around me were real Herbie Hancock fans and I felt that this was part of the joy of going out to a live performance. It wasn’t just going to be Herbie Hancock; in his band, this time, were also the genius saxophonist, Wayne Shorter, and the well-beloved bassist, Dave Holland, and, perhaps best of all, one of the all-time greatest drummers, Vinnie Colaiuta. I have to admit to not being familiar with the other musicians (but I soon enough got an education!). Right smack on time the band came out to a rousing applause and cheering, and then they got right down to work. I had no idea what to expect in a concert of this type; would Herbie Hancock make it a “popular” concert by playing some new works and also lots of old favorites? No, he actually did not; it was all “new”, so new, that in fact it seemed like they were generating it right then and there in front of us, it springing right out of the combined genius consciousnesses of those four great musical artists. At first the music was, shall we say, NOT “hummable,” but was, instead, as compositionally complicated as say, a whale’s song (not sounding like that, just complex like that). I began to worry that the young usher hearing this on the speakers out in the antechamber was deciding that he didn’t like it, and I had to ask myself, “Well, do YOU like it?” Almost as soon as I began to ponder my answer, I began to feel that the music made me feel ecstatic! Herbie was doing something way way down on the furthest base notes of the piano, some kind of interaction in the deepest realm of the piano that I don’t think I had ever heard used before, certainly not in such a way that Herbie was, interacting the depth of these notes so magnificently and beautifully that it certainly felt like brand new aural territory. Actually, from that moment on, I felt like this whole concert was “pontillism for notes,” as if the compositions were George Serault paintings, whereby he wouldn’t paint, say, a purple dot, but would paint a red dot and a blue dot next to each other, so your EYE got purple, but in a shimmering, dynamic way that bounced among the three colors. Herbie Hancock seemed to do that with notes, creating new notes from the combinations of adjacent notes. I had never heard anything like this before. About this time, the bassist made his presence known in the absolutely most subtle way possible, as if you could feel the vibration from his strings before there ever was a sound, and then following that, you could, barely, perceive an actual sound, so careful, so skillful, so controlled in intention. Fine acoustics, oh hell yes, that concert hall was PERFECT for hearing exactly what these musicians were putting forth, my whole body thrilled at that level of design and exposition. Then Wayne Shorter got into the act, giving us just as subtle of a tone from his saxophone as Holland gave us from his bass. He even could vibrate his saxophone’s reed WITHOUT it making a sound, a woody-version of Holland’s soundless vibrating string. Prior to that, I had always kind of thought of the saxophone as a nauseous instrument, never making a pretty note but, at best, sometimes being tolerable whenever it approached a sound that might be sweet or the rhythms were good. But Wayne Shorter put to rest that idea; his saxophone was as rich and beautiful and elegant as brass itself, as if his instrument were the sound of a luxury ocean liner from the an era gone by, all polished darkwood and velvet carpet, bubbling champagne, the richest food, and laughing ladies flashing diamonds, held steady on the strong arms of tail-coated millionaires, all solid and powerful over the deep splash of a gently rocking sea. Beautiful, just beautiful. And now, the drums. Had he been playing the whole time, I don’t know. But now he was beginning to stand out, this was not “just” a rhythm section, a human metronome whose only real purpose was keeping the time, no; this was an INSTRUMENT in its own right, and suddenly, rhythm seemed to be a new kind of melody. One could SING this rhythm, it had tone and notes and a music fashioned from the interactions of rhythms just as Herbie Hancock was creating pontillistic new notes from the interactions of other notes. Who knew that drumming could actually be so BEAUTIFUL? The various drums clearly had their own voices and they formed a choir, almost religious in their reverence. Prior to this, I always kind of “ignored” the drums (or thought I was ignoring them), but that will be impossible now. All in all, this concert was beyond anything I could ever have imagined; my knowledge was expanded, my appreciation was enhanced, and my ability to hear notes and rhythms elevated to a new and different plane. The experience was as uplifting as our row of seats was high. And I definitely plan to return to the Walt Disney Concert Hall again and again. I floated down from the concert hall clouds, yet maintained that sense of joyful elevation as I got into my car and drove up from the lower levels of the garage. I decided to not take the freeway home, but go the “slow” way (which, regarding getting to and from downtown is often the fast way) on a surface street. I selected Sunset as my route, and after this musical experience, was now entranced by the nighttime FRAGRANCE of gardenia and jasmine that floated down from the Hollywood Hills. Yes, it was now spring, arguably Los Angeles’s most beautiful season. As much as people hate Los Angeles in their love/hate relationship, and I am certainly no different than everybody else in this regard, we must not forget the LOVE portion of that equation. Right now, driving down Sunset at night after this incredible Herbie Hancock concert, smelling the spring flowers, I absolutely loved Los Angeles. Today, about a month later, it is still spring, Los Angeles’s nighttimes are still delicious, and Friday evening it was time for the Janet Jackson concert. Wow, what a different experience. In a way, whatever could go wrong, did. Friday was the last day of the first week back to work after two weeks of spring break and it was one of the longest weeks on record. Why, I can’t explain, but everybody felt it. On Wednesday I actually had to look at my calendar to determine what I had done last weekend, which felt like the first weekend after spring break, only to see that we hadn’t had that weekend yet, that we were only in the middle of the FIRST week back. So maybe the evening had gotten off to a bad start because I was stressed and exhausted from the long, painful week back. I planned to treat myself by having dinner over at Universal City Walk rather than going in the other direction back home to cook my own dinner. Eating out is less of a pleasure for me than it could be since I am following a very special diet (no more than 1,100 calories a day, and 40 grams or fewer of carbs a day), on which I have now lost 80 pounds (I now have the fat percentage of a fit 18-year-old). So NOTHING will cause me to break what I am doing; I got through Halloween, Thanksgiving, Christmas, New Year’s, my birthday, Valentine’s Day, and various other events without breaking my diet once, so this evening was not going to be an exception. I generally think of Universal City Walk as a crowded mess, mostly filled with rowdy teenagers, drunken, out of control adults, and, yes, gang activity. So while I wanted to eat there, I didn’t want to venture far into the City Walk. As the Gibson Amphitheater is over on one end (near the parking garage, I thought), I figured it best to eat at whichever restaurant was closest to the amphitheater that served the kind of food I could eat, which means, basically, protein and vegetables, such as chicken or fish, and non-starchy vegetables, maybe a green salad. I bring my own zero calorie, zero carb salad dressing, and my own zero calorie, zero carb Margarita mix, which I add to a bourbon and water to become a whisky sour. I won’t go to a restaurant without checking out their menu on-line first to see if they have what I can, and want, to eat. If I have to simply starve until I am back home, then that is what I will do. There was a restaurant that seemed to fit the bill, Saddle Ranch Chop House, so I made an on-line reservation. I kind of wasn’t excited about this; I had been there before at a party, and the place seemed to be very crowded and noisy, which I didn’t want. So after making my reservations, I decided to read some reviews of the place. Every single review complained about the slow service, often taking up to a half hour just to get your order taken, and then, of course, there would be another long delay before you actually got your food. Hummm, I had a concert to go to, that seemed unacceptable. So I cancelled my reservation and did a Google search for restaurants in the vicinity of City Walk rather than there at City Walk. A place called “Café Sierra” kept coming up with good reviews, but I had never heard of it and had never seen it, even though I drove past that area twice a day for nearly fifteen years, as it was on my way home from work when I lived in Hollywood. I did a Google Maps search for it and discovered that it was a restaurant inside the Universal Studios Hilton Hotel, right across the street from the entrance to City Walk. (No wonder I hadn’t heard of it; I had never been inside that hotel.) Perfect! I made reservations and they confirmed it was an easy walk from the Universal parking lot to there. I studied the Universal map and determined that the most convenient parking lot to both the Hilton Hotel (other than the hotel’s OWN lot) and the Gibson Amphitheater was the “Frankenstein” lot, so my plan was to park there in that lot. However, when I got there, I discovered that the Frankenstein lot was all barricaded. So I drove up to an employee directing traffic and asked where I could park, that the lot I planned to use was for some reason barricaded. He explained that the Frankenstein lot was for employees only (unusual, I believe, that the employee lot was the most convenient). Instead he directed me elsewhere, but it ended up where he sent me was VALET parking, which wasn’t what I was looking for. So, asking for more help and making another u-turn, I had to drive all the way around Universal to where the public parking was (in my opinion, quite far away), where I was faced with “Premium Parking” at the “Woody Woodpecker” lot that cost $20.00 (quite expensive in my view), or “Public Parking” at what they called “Jurassic Parking” that cost $10.00 (way more reasonable). Of course, “Jurassic Parking” was as far away as it could possibly be, all the way at the OTHER end of Universal City Walk. I must say I was shocked to see how crowded this immense parking garage was; if I kind of hoped that Universal City Walk went out business, there seems to no hope of that; apparently they have ALL the rubes they need. I was part of a solid line of cars going around and around the layers of this garage; it was a good thing that I had given myself an extra half-hour time cushion. It took that entire cushion just maneuvering into the correct parking lot, finding a parking place (on the very top level), and getting out of there and down to the Hilton Hotel. Despite the frustration of this, I did have “time” to be amused by the lack of consistency in parking lot names and also what I think of as a kind of grammatical error in the naming of the one where I was. Of course, they are named after various diverse properties owned by Universal; apparently they seem to have some ownership of or license for the “Frankenstein” character, but rather than continuing the theme of horror movie monsters (let’s say the other parking lots would be named “Dracula Parking” and “Wolfman Parking” or something), they jump over to a Looney Tune character, “Woody Woodpecker,” which leads me to believe that the other two ought to be named “Porky Pig Parking” and “Bugs Bunny Parking,” but no, the third lot is called “Jurassic Parking”. I guess “Jurassic Park” was a Universal Studios picture, but to be correct, in my view, they ought to call the lot “Jurassic Park Parking”. But anyway…. From Jurassic Parking, the Hilton Hotel seemed leagues away, so I opted for the shuttle. As is typical with ALL Los Angeles public transportation of ANY kind, the wait for, and duration of the ride of such transportation is so very often equal to, it not greater than, the time it would take to WALK the distance, and this was no exception. Even though the Hilton Hotel was “next” as far as distance was concerned, the route of the shuttle had to take us all the way down the hill and over to the Sheraton FIRST (and wait for the slow emptying out of the shuttle and then wait for its departure). THEN it went back up the hill and over to the Hilton Hotel. The shuttle had filled to the brim with people carrying immense amounts of junk food, which they continued to eat on the shuttle. Across the aisle from me was a woman who had a pillow-sized bag of caramel corn, which she kept shoveling into her mouth. The young man next to her (probably not her son, but a way younger brother, maybe?) said to her, “You are STILL eating?” She frowned at him as she continued tossing caramel corn into her mouth, “Of course, I paid $8.50 for this,” which I guess means that if she paid for it, she was going to damned well eat it, ALL of it (but all at one go?). This, by the way, became a kind of a “theme” of the evening, which I will explain in a bit. At the Sheraton, where all but one of passenger was staying, they oohed and awed over the mile-long Hummer limousine with the hot tub in the back that was parked in front of the hotel. They all wanted to ride in that hot tub. The shuttle filled up again, this time with a bunch of families with kids who fought over who was going to sit next to whom. Finally I made it to the Hilton Hotel and found my way to Café Sierra, which was a large, beautiful, extremely high-ceilinged room just past the hotel entrance. They definitely designed this to be an elegant restaurant, and I was greeted by a very polite, refined, maitre d’ who welcomed me and took me to my table. However, other than me (in a jazzy houndstooth raw silk sport coat), everyone there was families all dressed sloppy-casual, as if they had just been shopping at the mall, which in a way they had, but it was souvenir-hunting at Universal Studios after taking the Universal Studios tour. Not that there is anything wrong with that, but I think they all would have been happier at an all-you-can-eat buffet joint. I was really surprised to see so many families and concluded that this still must be spring break at the various public schools. He then wanted to “give me a tour”, which meant that he was going to point out where all the food was, starting with the dessert section (wrong). Oh, so it IS an “all you can eat buffet,” just dressed up in fancy serving trays. I said to him, “No thank you, I don’t want the buffet, I would like to order from the menu.” This was diet-forced, by the way; normally I LOVE hotel buffets, but something like that would do me absolutely NO good at this point. Ninety percent of what they had would be something I couldn’t eat, so I wouldn’t even want to LOOK at it. But from there we then had a bizarre conversation that I cannot unravel, but the upshot of it was that I concluded that he was trying to tell me something about how either you had to be a guest at the hotel in order to order from a menu (or maybe even be able to eat there at all), OR that tonight was buffet night for the guests of the hotel and there was no other option. I really don’t know, MAYBE what he was trying to get across was that they had a deal that included in the room price the buffet, I don’t know, but the two things he kept saying had to do with having to be a guest at the hotel and that there was no eating from the menu. Well, of course this was completely unacceptable, so I angrily got up and as I stormed out, the elegant maître d’ looked at me curiously and disappointedly, so I said to him that the whole thing was a disaster, that I had already wasted half an hour GETTING there, only to NEVER come there again and, on top of that, I now had to write a blisteringly negative review of a place where you have to be a hotel guest to have dinner and you can’t even order from the menu when you are on a special diet and I had checked out this place specifically to see if they served what I needed. He seemed shocked and told me immediately that of course I could order from the menu and that I could have anything I wanted, there had just been a terrible miscommunication, would I please come back and he would get me a menu right away. I truly have no idea WHAT the actual miscommunication was, but it really didn’t matter, he was making it right, so I smiled and said, “Yes, okay, that is good.” He asked me if I wanted a better table, but I said that the one I had was fine, and he asked me if I wanted a different waiter, but I said, “No, no, it was my fault” (and maybe it even was, who knows), so I was returned to my table and my Asian waiter practically ran to me with the menu. He said to relax and study the menu, but I said that I was already ready to order, that I had decided what I wanted before I had come in. So he pulled out his order book and I ordered the swordfish and a green garden salad. He asked me what kind of dressing I wanted, and I said that, like the drink mix, I had also brought my own dressing. He looked at me quizzically and said, “You don’t look like you have a bottle of dressing with you,” and I smiled and pulled out of my sportcoat pocket two packets of zero calorie, zero carb salad dressing. I will say that this is the first waiter I ever had since I had been on this diet who actually cared about, and understood what I was doing, now that it was explained to him. He was actually very impressed, and complemented me on my dedication. I said, “Well, this is how you lose 80 pounds,” to which he had to say, “Well, it looks VERY good, Gennelman,” which, thank you, I actually did know (because I worked for it) but I love hearing it. The meal was perfect; the swordfish was delicious and cooked correctly (I mean by that, not breaded and fried), every vegetable was exactly something I could have, and the quantity was right, as well. The salad had a good mixture of greens and vegetables that I could eat. It was a meal that did not break my diet one iota, and quite delicious, as was the drink. I did have time to notice the behavior of the various other diners, who seemed to be enjoying the buffet. What was most amusing was that somewhat near me was the dessert section and the main item there was a complicated, many-layered chocolate fountain that had about twenty different pans that both white and brown chocolate spilled into from one to another to another and another in a quite beautiful and artistic display. The diners had a large selection of fruits, strawberries, pineapple, watermelon, and so on, that they could spear and then douse in one of the chocolate streams. Children, especially, who could hardly reach it, seemed to love this fountain, returning again and again to get more of the fruit dipped in liquid chocolate. It was fun to watch their enthusiasm and joy with this. As the meal progressed, I wondered if the buffet would have been more cost-effective (I never did check to find out how much it cost); after all, I might have had the discipline to stick with fish or chicken, etc. ; but I think what I did was best, even though it wasn’t cheap. I also wanted to make sure the waiter got a noticeably good tip since I had made such a fuss and ended up getting what I wanted; I gave him 25%. I also realized that I PROPERLY also needed to tip the maître d’, although that seems to be lost in our culture currently, but lost or not, I understand that while they should get a tip as a matter of course, they definitely deserve one if they do a special service for you, which this one had, so I decided to slip him a $5.00 bill. I also realized that I needed to tip the piano player who had been playing and singing beautiful jazz standards. So, on my way out, I put two dollar bills into the piano player’s brandy snifter tip glass and gave him a smiling thumb’s up for the beautiful playing (and he for sure noticed and nodded his head in thanks), and then shook hands with the maître d’ who immediately felt the money in his hand and was genuinely surprised and well pleased. I was quite gratified. He said that he was very happy that I had stayed, and I said that if it hadn’t been for his help, I wouldn’t have, but I was glad I did. In truth, in retrospect, the whole thing was more expensive and more trouble than it was worth. But I don’t decry the experience. Now, it was time to head on over to the Gibson Amphitheater. It was a warm, perfumed, delicious night, just perfect for sitting outside for a concert. However, despite its name, it ended up that the Gibson Amphitheater is actually an INDOOR venue. Oh well, too bad, but maybe then the sound will be better. It turns out that the “Gibson” in that name refers to Gibson electric guitars, I suppose to serve as bookend to the Hard Rock Café over at the OTHER end of Universal City Walk (where I had to park). I don’t know, maybe the Gibson Guitar Company (or whatever they are called) somehow “sponsored” this auditorium. Everything is decorated with models of Gibson guitars, all of which have basically the exactly same shape, just come in different colors—yellow, black, red, turquoise—kind of silly as a decorative them, unless one simply goes wild over the whine of such a guitar (which I don’t). The interior lobby is filled with merchandisers (Janet concert tour t-shirts, Janet’s autobiography, souvenir photos, programs, etc.) all along one wall and junk food vendors all along the opposite wall. Oh, and you have to go through a pat-down before going in to make sure you aren’t carrying in a weapon, something I had forgotten about with this kind of place (or the kind of patrons they attract). It seemed like a long, long walk all the way around to the very far left end where my seating section was. I had forgotten that my seat was on the VERY end of its row. Oh well, maybe being on the aisle is good. But wow, so far over, why did I buy this seat, again? I got there at 8:00 and the concert was supposed to start at 8:15. Peculiarly, the amphitheater didn’t seem full at all. Actually, it seemed that there were more people roaming the aisles than there were people sitting in their seats. There was a CONSTANT stream of people (who soon enough began to feel like a parade of circus elephants) going up the aisle to go get some food and then bringing it back down again, large trays filled with mountains of French fries cooked in rancid oil, along with gallons of Slurpies or other junk liquids. Honestly, it seemed like the name of this game was eating junk food more than it was attending a concert, and the second most-important activity was taking pictures of each other with camera phones. Oh, and third was texting messages to the Amphitheater’s monitors. “I luv yu Janet!!!!!! !” “My boyfriend is wonderful to bring me to this concert!!!!! !” “Bill loves Steve!!!! !” I get the idea that the exclamation mark key on these people’s phones has all the paint worn off them. Time proceeded on, 8:15, 8:30, 8:45, and all I had had to look at was a landscape-oriented monitor showing its version of what was being shown on a screen to those in the center, that was in portrait orientation (in other words, the view for my section was distorted). Besides the text messages and various advertising, what the monitor mostly showed was a way-too-broadly smiling face of Janet Jackson and something about “True You,” which took me nearly half an hour of looking at it to finally realize that it was a book she had written. Books are generally in “portrait” orientation, which is why my brain did not immediately register that’s what it was, because on our monitor it was stretched wide to fit its landscape orientation. Once I realized that it was a book she had written, I wondered about the process of hiring a ghost writer (which I was sure she must have done). Is there one that they all know via word of mouth? How do you judge a ghost writer? And what a lame title that is, anyway, “True You.” I couldn’t think of what she would have to say that would make a readable autobiography. Sure, I like her music, and yes, she IS one of the Jacksons, but really, WOULD this be all that interesting? Well, not to me. Oh, and then there were those two spotlights on the other side of the stage, shining at me; they looked like the headlights on a Jeep and no matter how many times my eyes swept past them (hundreds of times), I kept forgetting that they WEREN’T the headlights on a Jeep and I kept wondering for a second why somebody didn’t turn them off. By now I think the audience was getting tired of the delay. Finally, every single seat was filled (did people KNOW that she was going to be very late?). The audience had taken to clapping and cheering very loudly whenever a background song on the sound system came to an end, as if by their enthusiasm they could MAKE her appear. However, all that would happen would be yet another background song would play. This cycle must have occurred a dozen times. Then, at about 9:30 or so, the voice of Janet Jackson could be heard and the audience stood up on its feet and ROARED. Wow, she is finally here. I was in too bad of a mood to stand up (I felt no respect), so I just sat there and looked at the monitor. Janet was not out there, they were merely running one of her music videos. What was this, a kind of joke warm-up act? To me, showing the music video was a tactical error. It made me realize that what I knew of her, what I LIKED about her, was her music videos. Yes, I HAD purchased one of her CDs, “Rhythm Nation” (decades ago), and really liked it a lot, but I never bought any more of her albums. (Michael, in contrast, I bought every single one of his albums, and even bought all the videos, as well.) I DID download from iTunes about eight or nine Janet Jackson music videos, many of which are pure genius. I thought to myself HOW could a live performance measure up to these well-crafted, expertly-directed, phenomenally-well-danced-by-a-huge-corps-of-dancers music videos? Even this one shown here at the concert (and then a SECOND one they had the gall to run) was clearly going to be much better than anything that was going to happen live on this stage. I understood that I would have done better watching THIS music video at home on my own wide screen high definition good sound system monitor and not paid any more than about $9.99 for the download. Now it was only stubbornness that kept me still sitting in this auditorium. I really simply wanted to get up and go home. It wasn’t a matter of getting my money’s worth, I had SPENT the money, regardless; it was a matter of what was going to make me happier. It was an anti-climax when she finally DID arrive at about 9:45, a whole hour and a half late. First the band came out on stage, about five thugs wearing what looked like white pajamas. They sat behind their instruments along the far wall of a box that was mostly INSIDE the stage, so that where I was sitting, I could only see the one who was the furthest outside. The monitor did NOT pick them up. There was a large blue-lit cloud of steam or smoke which didn’t excite me in the least and when it cleared, there was Janet standing there wearing white jeans and a short white vest that seemed to accentuate that she must have been gorging on the same junk food that most of the patrons at this concert had been carrying down the aisles. She had plastered on her head an earphone headset with a microphone that went across her face, kind of spacy/android in effect, not like actually having a person out there, one you could see, anyway. With her were four, I think (it was very hard to see), back-up dancers, quite ugly-looking, actually, wearing clothes that made no impression on me at all. Their dance moves, such as they were, and Janet’s, were so basic and lame that a two-year-old child could have done as well, if not better. There was no thrill or excitement associated with what they were presenting, instead, it felt like they all were just going through the motions and hoping to get it over with quickly. I could see the edge of the monitor all the way across the auditorium that showed that in the center of the “box” that was the stage, at the rear, was a large projection screen that showed something like a flowing street scene in Los Angeles. This did not show on “our” monitor at all. In other words, these seats really WERE so terrible that basically we could see only about 1/6 of what was there. And what we COULD see was very boring. The sound was equally bad. The speakers all pointed frontwards, towards the center of the auditorium, so by the time the sound echoed back over to where we were, it was just a loud muddy bass (kind of like listening to the distorted hip hop of a drug dealer driving down the street) punctuated by her indistinguishable whine. Her lyrics could not be understood as the sounds were simply a blend, like melted frosting on a cake. I did realize, though, that she was singing a medley, but if you like a song, you want to hear the whole song, not just a piece of it. Oh well, she wasn’t singing ANY song that I liked, nor was she putting any emotional modulation into any of it. It was just all at one steady level, loud, much like the singing done by a no-name theatrical company on a Carnival Cruise, meant to signify “excitement” to the musically deprived, but in actuality, just either puts people to sleep or else drives them away (on a Carnival Cruise, to just go gamble, instead). I was irritated by all the people in my section standing up, so I was forced to stand up, too, just to see what was going on. When I saw Donna Summer at the Hollywood Bowl, her concert was so exciting that almost everybody (including me) was standing up and dancing at our seat or in the aisle (including me)…now THAT was a fantastic concert! But here, nobody was dancing (what was there to dance to, really? ), and they were only standing so that they could see. What I saw, the boring medley continued, the back-up dancers, two of them by now (I guess the other two went back where we couldn’t see them from where we were), were just standing there, not even dancing at all. Well, I was now on my feet, so I used them for what they were made for, I walked on out of there. I was angry enough by this debacle to contemplate attempting to demand to get my money back (if one even could, something I have never had to attempt before), but there was no manager on site that I could see, only endless vendors. I finally shrugged and decided that I had been tainted by this experience enough, to just go on outside and be done with the whole nasty enterprise. Ah, but that delicious night air felt good. It actually made me happy again, so much so, that I even enjoyed all the drunken patrons having their own enjoyment at Universal City Walk. They, at least, had had the smarts to not attend the Janet Jackson concert. They were having their own fun having drinking games at Bubba Shrimp or whatever; ah, people, gotta love them. Jurassic Parking ended up feeling closer than it had when I was rushing to get to Café Sierra. I found my car easily enough. As I sat down behind the wheel, I ended up having an amusing thought. This whole thing had begun due to my feeling bad at never having been to a Michael Jackson concert. Now I felt that I hadn’t missed a thing. p/b, Thats an interesting looking building and worthy of a photo project. And it was good that you could get to see Herbie Hancock. I'm sure he might have even collaborated with Miles Davis during his trippy 1970's period. But I do know that a good concert can give you a great feel good factor lasting several days after the actual gig. That happened to me for about a week after seeing Beach Boy Brian Wilson in a London Summer outdoor concert a couple of years ago. So few artists can re-create that original sound. But this is something he's good at. But regarding Jacko, you know there definitely was a kind of muted effect over here in the UK. There wasn't that kind of national outporing of love that we heard about when Elvis died. Was it anything to do with all the court cases he was embroiled in, and stories of how he paid off the victims families. But sure, he was an enigma. Dee, thank you for your comment! The Walt Disney Hall is pretty fascinating architecture (worthy of your photographic skills!) and where it really shines is inside the concert hall, itself, both in an audience's ability to hear and to see. Brian Wilson sent his two daughters to the school where I work, and he did a benefit concert on our upper playing field a couple of years ago; it was fantastic. In a way, I had "forgotten" how much I had loved the Beach Boys, but, believe me, his concert ROCKED! A huge feel-good show. I am glad you got to see him in London (even feeling it a week later!). Regarding Michael Jackson, it is hard for me to wrap my head about FIFTY sold-out concerts in London. Could that possibly be true? FIFTY (not five?). All in ONe city? All sold out? And from what I understand, when the concerts didn't happen (due to his death), most ticket holders opted to simply keep their ticket as a souvenir rather than get their money back. That's just mind-boggling. I never accepted (and still don't) that he was a "child molestor". Our school had a program (like so many others) of taking children to Neverland Ranch to ride the rides, see the animals in the zoo, etc. I spoke with several teachers who had gone on those field trips and not ONE believed any of the accusations, and for sure, if they had had the slightest legitimate suspicion, they never would have supported those trips. My view is, what was Michael doing on all his global concert tours? As far as I know, he spent so much of his time visiting children in hospitals and orphanages. Either that, or shopping! It's not as though he was visiting all the famous child brothels around the world (India, Thailand, etc.) Hell, in some of these places, he probably could have BOUGHT a kid as a sexual slave if he wanted. But no, that's not what he was about. Instead, he was a victim of the lowest money-seekers that humans can produce, which sue-happy America is so good at generating, apparently. I figure he was one of the most-watched human beings on the planet; had virtually NO privacy whatsoever. Those few people who would turn on him and serve as witnesses against him during a trial (servants, etc. ), what the hell were they doing PRIOR to that (if what they were telling was the truth)? Just waiting for a money-making opportunity, the coattails of which they were willing to ride on? And anyway, some of the kids who had actually been closest to him testified as sovereign adults that nothing bad ever happened. On the other hand, I do know how many lawsuits there are against celebrities, and particularly Michael Jackson. If they weren't trying to get money out of him for "child molesting" (those who had left their children in his care in the first place), they were suing him for stealing their music or ideas or whatever (did a single person ever win one of those legal actions?). I didn't mean to turn this into a "not-anti-Michael-Jackson rant", and I am only stating my opinion, anyway...I certainly didn't know him, myself, nor did I ever even see him in person. But I do know this--I used to read, and even share, all sorts of negative gossip about celebrities (it's kind of an easy trap to fall into, as celebrities are endlessly fascinating and envy lurks around the corner), but then when I actually worked with or around a huge number of celebrities for nearly a year, where I could "see them in action," I NEVER saw or heard anything that was worthy of negative gossip. I concluded that for the most part, all of it was false. Instead, these are professional, dedicated, hard-working people who care about their craft, otherwise they wouldn't last very long. I vowed that if I never saw it, I would never spread anything negative, and I never saw it. I put Michael in that same category. I may be wrong, but the truth is that his life was really none of my business, other than to buy his music if I liked it, and I did, so I did.